B. E P.q.--445 May 10, 1937. North America to those countries. 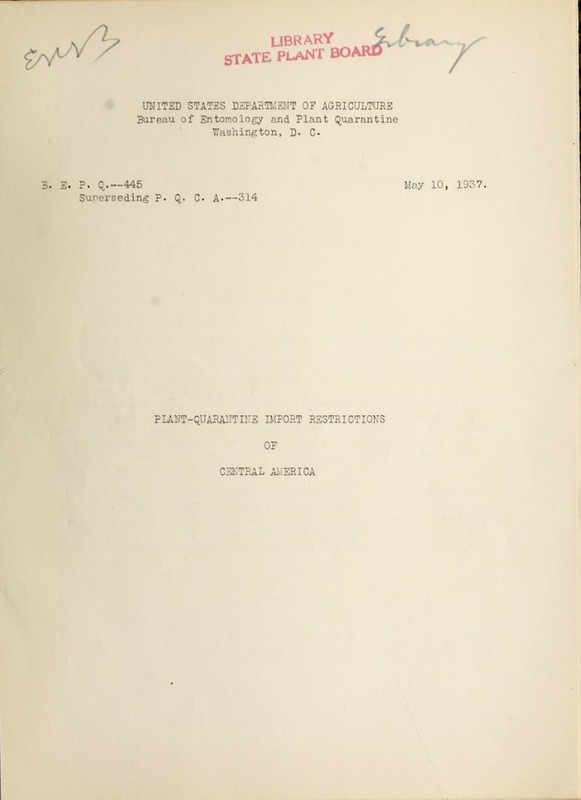 Flant quarantines, from the original texts or his translations thereof. quarantines themselves should be consulted for the exact texts. C '...RAL A ERI IICA. necessary by the Agricultural Officer. time by officers of the Department of Agriculture. or processed vegetables, grains, seeds, dried beans, and seas). ing that the products are of home origin. origin and inspection issued by the Agricultural Officer. Agricultural Officer after inspection and, if necessary, fumigation. De-.-rtnent of Agriculture rs the Agriculturai Officer rr-&y deemn necessary. ThE REUBLIC OF COSTA RICA . roots, tubers, bulbs, rhizomes, stems, etc. after notifying the owner, who shall have no rights of indemnity. forest plants, will not be subject to the provisions of this decree. country. The certificate is to be visaed by a Guatemalan Consul. The above applies also to mail importations. flower and vegetable seeds sent in small quantities by mail. certificates before the customary permit can be issued. exceeding 10 pounds are excepted from the certification requirement. (Decree of Ap&r. 28, !'.::. This Republic has no plant-quarantine import restrictions. than that on used sacks. offered for entry into the Republic of Salvador. placed as such in section 2, title 1, chapter 2.
ponding certificate is not presented. cated by the bill of lading.